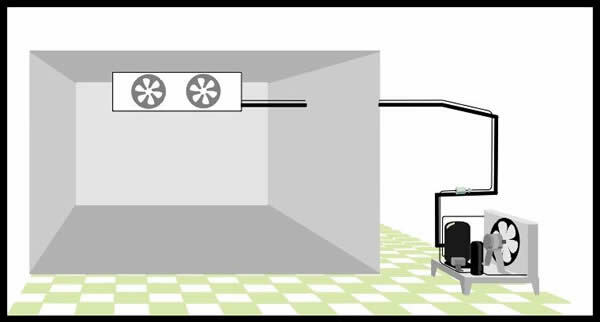 To make our cyber space refrigeration system a little more realistic lets separate the evaporator away from the compressor section and put it inside an insulated box. The left over components can now be called a Condensing Unit. The insulated box does not conduct heat well. If we lower the temperature of a refrigerated product inside the box we want to slow down the rate of thermal gain from the rest of the world outside the box. There has been oil added to the compressor sump to keep the moving parts inside the compressor lubricated. The suction line returning to the compressor has been sloped to aid in returning oil to the compressor. The oil is slowly depleted from the sump by getting entrained in the refrigerant and proper piping practices must be used to insure its' return. Also notice that the liquid line has been made smaller. The same quantity of refrigerant can be contained in a much smaller pipe when it is in the liquid form. The suction line has been connected to its' proper place on the evaporator; the bottom. Consider the direction of flow, the liquid refrigerant (which probably contains oil stolen from the compressor) enters the top of the evaporator and now has gravity on its' side to return the oil where to it belongs (just like the sloped suction line). Consider the heat flow within the insulated box. The evaporator is constantly recirculating air in a forced convection loop around the box. As the cold air passes over the product to be refrigerated, once again we see a thermal transfer taking place. If there were a bunch of boxes of warm eggs placed in the cooler some of their heat content would be picked up by the cold air and that air is sucked back into the evaporator. We know what happens then. The heat is transferred through the fins, through the tubing, and into the refrigerant and carried away. That same air has been cooled and is once again discharged back over the product. The next graphic shows this loop and the pink and blue colours represent air with more heat content and less heat content respectively. I hope you enjoyed the original Refrigeration Basics section. It covered a lot of material but this was done by just barely skimming the surface of things. You should now have a general idea of what refrigeration is and how it is accomplished. There are of course many issues that must be looked at in much greater depth. We will try to do this in the same easy to understand fashion using pictures, animation's and interactive objects where possible. You may jump around all you want to different areas of this book however it has been designed in a way where subsequent sections are often based on the previous sections information. You will probably find things easier to comprehend by following the sections in the order they are presented. Copyright © 2019 - Keep It Cool - All rights reserved.